The Cumbria Way was first devised by local Ramblers Association members in the the mid 1970's. The route is a picturesque 70 mile trail through the heart of the Lake District. The South to North trail starts from Ulverston, at the Southern end of Cumbria, bisects the Lake District, and finishes in the historic city of Carlisle. Walking is unquestionably the best way to see this celebrated landscape and unsurpassed scenery. There are a few sections of Lake District high ground that need to be crossed by way of mountain passes but this is a mainly low level route through the valleys. The terrain on this trail is a diversity of undulating farmland, country lanes and rocky mountain paths. The Cumbria Way is an official national trail, but it is not fully way marked, therefore map and compass reading skills are essential. The Cumbria Way leads through farmland, past the peaceful waters of Coniston and into the rugged but scenic Langdale valley. The trail then rises through Stake Pass for wonderful mountain views, and into Borrowdale, which like Langdale lays claim to the title of the Lake Districts prettiest valley. 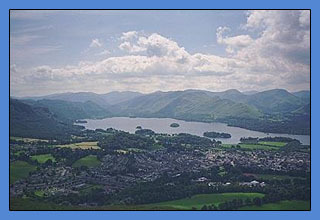 Onto the charming market town of Keswick at the Northern end of Derwent water then a day in the hills as the trail rises again to round Skiddaw before descending to Caldbeck. From here riverside paths through farmland leads to the historic border city of Carlisle. Typically you travel to Ulverston and overnight ready to start your walk the following morning. Each night on the trail you stay in a different location in prebooked selected accommodation, with breakfast provided. Your luggage is collected daily and moved to your next accommodation. Please do not hesitate to ask if you have any questions about the route either before you start your holiday or while you are walking the trail. Our self guided holidays are booked on an individual basis and therefore you can start your holiday on any date of your choice between April and October, and include rest days if required. This tour is available throughout the year. Guidebook and route map for the group Leader. Generally this is a moderate route though strenuous walking is encountered when crossing the mountain passes at Stake Pass and Skiddaw. Below are suggested itineraries however we can also put together a tour to meet your specific requirements. Therefore you can add or reduce the number of days you are on holiday or add rest days. Let us know your requirements and we will confirm an itinerary and price. Accommodation is provided in carefully selected walker friendly B&Bs, Guest Houses, small Hotels and Inns. We try to book rooms with ensuite or private facilities every night, however in a few villages ensuite accommodation is limited and we may have to book rooms with shared facilities for one or two nights of your holiday. There are very few single rooms along the route and therefore the accommodation owners generally allocate a double or twin room for single occupancy. We can accommodate one single occupancy per booking for the average supplement of £20 per night. If you require additional single occupancy rooms, they will be charged at the extra cost incurred. This can be up to full double/twin room rate. Breakfast is included. Packed lunches can be purchased from your overnight accommodation or from local convenience stores. Evening meals can be purchased in pubs and overnight accommodation when a pub is not available. For the duration of the walk your luggage is transferred between overnight accommodation by luggage transfer service, so all you need to carry is a day rucksack and its contents. Reduced price ‘Advanced tickets’ are sometimes available and can be purchased from approx 12 weeks prior to departure. By car Limited non-secure parking is available in Ulverston. Please contact us if further information is required. By Air The most convenient major International airport with rail links is Manchester Airport. The terrain varies from footpaths, farmland, country lanes and rocky paths in the mountain passes. The route is not fully waymarked but it is generally easy to follow with the aid of a route map and compass. A guidebook and map are included. Additional guide books and maps are available for the route. A full English breakfast is included in the cost of your holiday and is served at your accommodation. Packed lunches (average cost £5) are available to buy from your accommodation or local shop, and evening meals (average cost £12) are generally available from local pubs or your accommodation. Good outdoor clothing and waterproofs are essential. A suggested equipment list will be sent to you. For information on travelling to and from the route please click the travel tab at the top of this page.